On Wednesday 3rd February SONA opened the doors of its Coventry Technology Centre and welcomed editors from the UK’s leading trade journals. As part of the SONA launch, editors had the opportunity to experience the new fire and carbon monoxide safety technology which is used and trusted by over 90% of the UK’s Fire and Rescue Services. The local West Midlands Fire and Rescue Service was in attendance to support the new product range and host a demonstration of domestic fires. Using their mobile demo unit and fire engine they will highlight how dangerous domestic fires are and how quickly a small fire can engulf a home. Within the UK trade sector, SONA is built on three core values offering performance, reliability and best ever service. After three years of careful research and development, with over £1m investment, SONA has been launched to specifically address the evolving needs of social housing, delivering the ultimate range of fire and carbon monoxide protection solutions. Advanced, intelligent sensors combined with ‘always-on’ safety technology, deliver enhanced levels of safety for tenants and property. Unique energy saving features help ensure SONA not only saves lives, but reduces carbon footprints whilst keeping costs down for consumers. The SONA range includes a portfolio of domestic fire and carbon monoxide solutions. 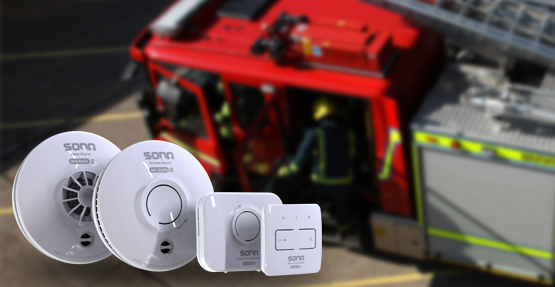 Using Thermoptek Multi-Sensor technology, SONA smoke alarms offer significant application advantages due to its ability to sense both fast flaming and slow smouldering fires without false activations and nuisance alarms. British engineering and quality control are at the heart of SONA. With all alarm devices manufactured in bespoke, state of the art factories, with strict quality assurance overseen by British engineers using test rigs and procedures created at our Coventry Technology Development centre. It’s an exciting time for SONA and we look forward to sharing our developments. Check out our product range and stay posted for future news.